stylelint is a linting tool. A linter is an application that checks code for potential trouble spots, enforcing coding conventions such as spaces instead of tabs for indentation. 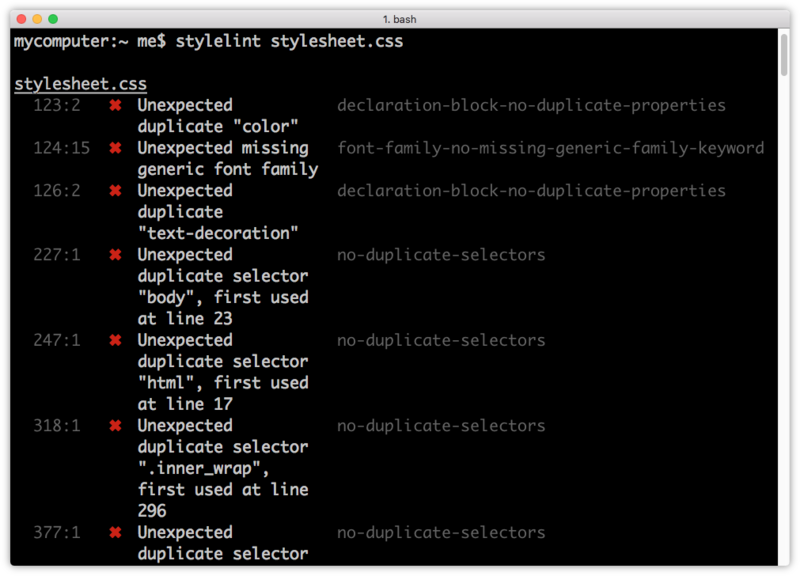 stylelint can find problems such as duplicate selectors, invalid rules, or unnecessary specificity. These have the greatest impact on CSS maintainability. UnCSS, on the other hand, checks your CSS for unused selectors and style rules. It parses a stylesheet and a list of HTML pages, returning a CSS file that’s stripped of unused rules. Both of these tools use Node.js and can be installed using npm. If you’re working on a small site, such as a personal blog or a few pages that are updated infrequently, many of the problems that these tools flag can safely be ignored. You’ll spend time refactoring for little gain in maintainability and speed. For larger projects, however, they’re invaluable. They’ll help you head off maintainability problems before they start. stylelint helps you avoid errors and enforce conventions in your styles. It has more than 160 error-catching rules and allows you to create your own as well via plugins. stylelint supports over 150 rules that check for syntax errors, indentation and line-break consistency, invalid rules, and selector specificity. You’ll find a complete list of rules and their available values in the stylelint User Guide. Replace /absolute/path/to/ with the directory to which stylelint-config-recommended was installed. Global npm packages can usually be found in the %AppData%\npm\node_modules directory on Windows 10 systems, and in /usr/local/lib/node_modules on Unix/Linux and macOS systems. Type npm list -g to locate your global node_modules directory. stylelint can also lint CSS that’s embedded in HTML files using the style element. Just pass the path to an HTML file as the argument. When complete, stylelint will display a list of files that contain errors, along with their type and location, as shown in the image below. UnCSS parses your HTML and CSS files, removing unused CSS. If your projects include a CSS framework such as Bootstrap or use a reset stylesheet, consider adding UnCSS to your workflow. It will shave unnecessary CSS—and bytes—from your code. For a full list of commands—and an example of how to use UnCSS with a Node.js script—consult the UnCSS docs. Running these tools probably seems like a lot of extra work. To that end, consider adding a task runner or build system to your workflow. Popular ones include Grunt, Gulp, and webpack. All three have robust documentation and sizable developer communities. Above all, however, take a pragmatic approach to building your toolkit. Add tools that you think will enhance your workflow and improve the quality of your output.